SINGAPORE'S City Development Ltd (CDL) and Starwood Hotels & Resorts Worldwide have teamed up to open The Residences at W Singapore Sentosa Cove, which will be sold at S$2,500 to S$300 (RM5,825 to RM699) per sq ft. Scheduled to be ready in 2012, the project comprises 228 private luxury residences starting from two-bedroom units measuring 1,227 sq ft to penthouses measuring 6,297 sq ft. This translates into the smallest unit costing between S$3.07 million and S$3.68 million (RM7.15 million and RM8.57 million), and the penthouse from S$15.74 million to S$18.89 million (RM36.67 million to RM44.01 million). During the launch of the project in Singapore recently, CDL managing director Kwek Leng Joo said he expects the project to attract many investors although there are other residential developments within the cove. 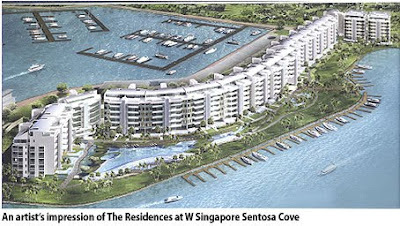 He attributed this to The Residences at W Singapore Sentosa Cove being the only integrated project in Sentosa. It will also have a hotel and retail component. Asked about the likelihood of Malaysian investors buying the property, Kwek said: "For Singapore, Malaysia has always been a traditional source of buyers and vice versa. I will be surprised if not a single Malaysian buys the property." The residences will be ready in 2012, and slightly before the hotel and retail portions. A 240-room marina hotel, operated by W, is said to be the first of such in Singapore while the retail component, focusing on food & beverage and lifestyle products will have a gross area of 86,000 sq ft. Although Kwek was unable to reveal the construction cost of the developments, he said that it expects the return on investments (ROI) for the hotel portion to take less than seven years. In 2006, Sentosa Cove was awarded the marina Quayside site, which is collectively called The Quayside Collection. CDL paid S$255 million (RM594.15 million) for the land only, which has a 99-year tenure beginning October 1 2006. The Residences at W Singapore is conceptualised by architectural firm Wimberly Allison Tong & Goo. It comprises seven six-storey blocks with attic and one basement car park. The entire site with an area of 250,407 sq ft will have 42 two-bedroom units measuring 1,227 to 1,292 sq ft, 86 three-bedroom units (from 1,625 to 2,626 sq ft), 66 four-bedroom units (2,067 to 2486 sq ft ) and 34 units of penthouse (2,217 to 6,297 sq ft). 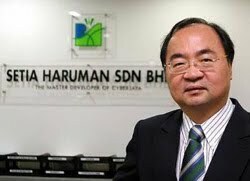 Setia Haruman Sdn Bhd, the master developer of Cyberjaya, is targeting to fully develop the city within 15 years, says chief operating officer Lao Chok Keang. In an exclusive interview with StarBizWeek, Lao says currently about 35% of 3,705 acres of saleable land has been taken up. “Land use for enterprise consists about 1,181 acres, commercial 352 acres, mixed development 290 acres, residential 1,564 acres, institutions 308 acres while light industry is about 10 acres. With better accessibility nowadays to Cyberjaya, I think we can see the full development of Cyberjaya within 15 years,” he says. Lao Chok Keang says the role of the company is to undertake all aspects of Cyberjaya’s development. Setia Haruman has been entrusted with the role to plan, design and prepare the primary infrastructure for the Cyberjaya Flagship Zone. The area covers 7,129 acres of freehold land consisting of four main zones known as enterprise, commercial, institutional and residential. Each zone is fully equipped with a host of intelligent network services and interactive broadband services. Since its launch in 1997 and some RM2bil in investments, Setia Haruman has successfully developed Cyberjaya as the country’s intelligent city. Cyberjaya has also taken shape to become an eco-friendly city with lush landscape gardens and streetscapes. The city is fully equipped with wireless interactive city broadband services, fibre-optic networks and the latest technologies in information technology infrastructure and facilities. Development in Cyberjaya has gained momentum since late last year, Lao says, citing the price increase of commercial land, which has risen to RM120 per sq ft from RM100 per sq ft.
“Despite the slight increase, the land here is still cheaper compared with the Kuala Lumpur City Centre area. Apart from large developers such as Mah Sing Group Bhd and Glomac Bhd launching new projects here, we are also in talks with five parties that are keen to acquire land in Cyberjaya for development. Three of them are public listed companies,” he says. Lao says the role of the company is to undertake all aspects of Cyberjaya’s development, including planning and designing, providing basic infrastructure, marketing and selling of land parcels and other real estate developments. “Setia Haruman offers assistance to Multimedia Super Corridor status companies in obtaining the right land and approvals for sub-division and building plans,” he says, adding that more than 50 buildings with 5.8 million sq ft of office space has been completed for leading companies such as HSBC, Shell, DHL and Motorola. “Other major ongoing developments include HP campus (600,000 sq ft) and the Inland Revenue Department headquarters (600,000 sq ft) at enterprise zone, Garden Residences by Mah Sing at residential zone and also Glomac Cyberjaya (220,000 sq ft) at mixed development zone,” he says. Lao says the company has built and sold over 3,000 units of residential homes that include 200 high-end properties. Some of the new commercial developments include the CBD Perdana 2, comprising 256 units of four- and five-storey shop houses with a total gross development value of RM210mil. “Setia Haruman is also working with UEM Land Bhd to develop a mix development project on a 100 acre plot at Perdana Lake View West. When the development of Cyberjaya is fully completed, there will be a total of 42,000 units of residential houses in the city,” he says. On land sales figures, Lao says the company registered about RM500mil last year. This year the company is targeting about RM600mil based on increasing demand from buyers and investors. The Government’s plan to tender some of its land in Kuala Lumpur for development by the private sector must be one of the most awaited news by property industry players as sizeable land has become scarce in the capital city. Given that most of these parcels are located in prime locations and offer good potential to be redeveloped further add to the excitement. Probably the most sought after land includes the 50 acres at Jalan Cochrane worth some RM2bil and the 20-30 acres in Ampang Hilir near Kuala Lumpur city centre. There are other smaller parcels in Jalan Stonor, Brickfields and Bukit Ledang (off Jalan Duta). This should be the best opportunity to undertake a thorough study on some of the interesting and necessary projects that will further add value to the people and liven up the city. Although there are a number of ongoing residential developments in the city, most of them are high-end residences that are out of reach of the middle income bracket. What is lacking is good and well planned projects that have smaller built-up and are priced more affordably to cater to a broader range of buyers. Projects worth looking into include small office home office to cater to small business start ups, apartments from 1,000 sq ft to 2,000 sq ft and family lifestyle facilities. Most cities around the world have beautiful parks and a number of structures dedicated to promote art and culture. Kuala Lumpur can benefit from these types of projects. It is necessary to draw up a well thought out master plan that spells out the broad development plans and concepts for the government land i.e. whether projects should be residential or commercial, the property types and price range. Adopting an open tender process to identify the best developers for the land will be ideal as it will attract higher quality proposals from calibre developers. It will facilitate greater participation from industry players with the right track record and expertise to add value to the land. It will also be in compliance with the Treasury’s rule which requires all projects worth more than RM500,000 to be subject to open tender. Ultimately, there will be more well-planned developments and higher revenue for the Government, which will benefit all Malaysians and the country. The Government’s plan to form a joint venture with the Employees Provident Fund to promote the development of 3,000 acres of Rubber Research Institute of Malaysia land in Sungei Buloh will also be followed closely. All the necessary components should be holistically and carefully thought out to ensure it becomes a model township not only for the Klang Valley but the whole country. As Sungei Buloh is well known for its road congestion, the relevant authorities must come up with proper traffic planning. There should be designated areas for the right types of residential and commercial properties, well linked and highly efficient public transport infrastructure and sufficient public facilities. Deputy news editor Angie Ng hopes this timely opportunity to raise the quality of the living environment will not be wasted.